This is a coming two-weekend course for STM (TEE) in Kuching, Sarawak, Malaysia. We are living in a time of a tsunami of change. Christians are often swarmed by newer and latest technologies without having a chance to examine the ethical considerations. This course will help to surf this tsunami by evaluating from a pastoral-theological perspective, issues that will involve everyone at some time in their lives. These issues include abortion, mercy-killing, advance medical directives, test tube and designer babies, gene editing, stem cell therapies, cloning, reproductive issues, gene therapy, prenatal testing, chimera research, life enhancement, aesthetic surgery, organ transplant, and regenerative medicine. These challenges are affecting every Christian in one way or other. This non-technical course is for pastors, church leaders, counsellors and church members who are interested in surfing. Medical utopias are often about good health, absence of suffering, and even delaying of the aging process. 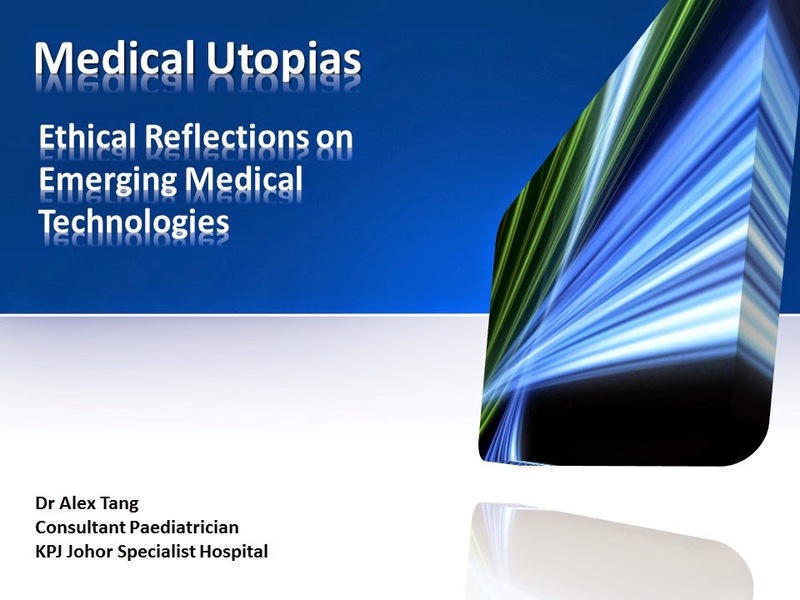 The last two decades have seen a tremendous increase in emerging medical technologies to achieve these utopias. The completion of the sequencing of the human genome sets the stage for the next step of genetic and molecular advances. The increase in computing power, storage capacity, connectivity, and the Internet has opened avenues of new diagnostic and therapeutic modalities. The perfecting of sustaining cell growth in vitro and cell nucleus transfer has opened the way to cloning, stem cell harvesting, and a new field of regenerative medicine. However, these emerging technologies bring with them a large number of bioethical concerns that need to be addressed. These concerns involving tissue engineering, bioelectronics, new genetics, cloning, gene therapy, germ-line genome modifications are only the tip of the iceberg. In this paper I will reflect on three areas of concern. Firstly, the emergence of the digital patient will be considered. This digital patient will be deeply formed and informed by health information technology (IT), the social media, and issues involving privacy, confidentiality and data security. Secondly, the direct to customers (DTC) genetic screening tests will be discussed. The ethical issue of buccal swabs taken at home and be tested for genetic diseases and future prediction of other illnesses which is marketed directly to the consumers will be examined. Finally, the development of new pharmaco-therapeutics will be explored. There have been changes in the way new drugs are tested and these changes do raise some ethical concerns. The examination of these ethical issues will be done in the framework of respect for autonomy, beneficence, non-maleficence, and justice. Synopsis Advances in medical treatment modalities, biotechnological innovations, and genetic-molecular manipulations have brought about a set of unique challenging issues not faced by the Church before. A pastoral-theological approach is needed to examine, reflect and develop responses to these difficult moral and ethical issues such as test tube and designer babies, facts and fallacies of stem cell therapies, cloning, reproductive technologies, abortion, mercy-killing, allocation of scarce healthcare resources, living will, gene therapy, prenatal diagnosis, and aesthetic surgery. Speaker’s bio Dr Alex Tang is a senior consultant paediatrician in the Johor Specialist Hospital in Johor Bahru, Malaysia. He received his medical training from the National University of Malaysia, post-graduate training in Singapore and the United Kingdom and his theological training from the Malaysia Bible Seminary and the United States. Alex has published numerous articles on bioethics, written two books on the Christian response to biomedical ethical issues and taught courses on biomedical ethics in seminaries in Singapore and Malaysia. Please click here to download a pdf version of this.